Some mornings I wake up with a feeling of being disconnected from what's happening around me. Maybe I'm just tired. Maybe I'm feeling grief tap me on the shoulder. Maybe I'm letting the "I am not enough" gremlins tap at me. 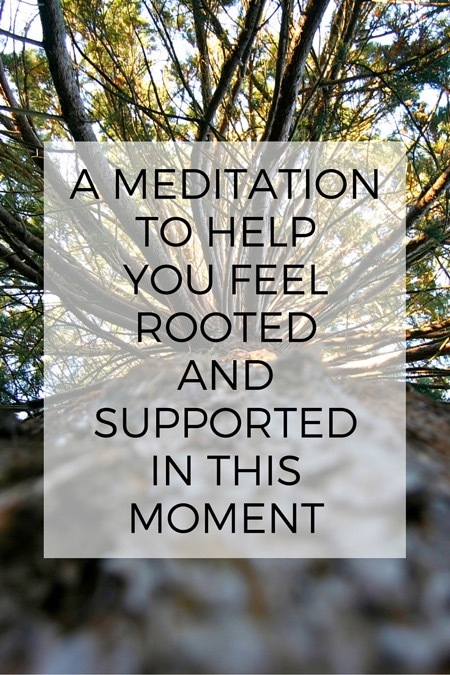 On those days, I sometimes turn to a meditation I like to call "rooted" to invite me to remember that I do know how to feel grounded in my life and to help me remember to call on the earth for support. Here's how I practice this meditation. This can be a beautiful practice done outside but most days I just do it right inside in my studio or living room. I stand barefoot and bring my awareness to my breath. As my breath begins to lengthen, I start to imagine I'm exhaling down through my body, all the way through the soles of my feet. I literally imagine I can feel my breath exhale down through my chest, belly, pelvis and hips, legs, and feet. After a few breaths like this, I begin to imagine roots are growing from my legs and anchoring me to the earth. When I feel that grounding, I bring awareness to my next inhale and imagine drawing up energy from the earth through my roots and into my body. I keep breathing, noticing, letting my body, heart, breath deeply connect to the earth continuing to use that image of drawing up energy through my roots and into my body. Staying here for as long as feels right in that moment. When I feel complete, I pause, bring my palms together at my heart, and say "thank you" to the earth for holding and supporting me. Meditation note: Sometimes when you try standing meditations with your eyes closed, you can get a bit dizzy. I avoid this by swaying just a bit and being sure not to lock my knees.